Today, my little blog turns five. When I started blogging, I’d just finished drafting my first manuscript (it was awful), and my daughter was still napping twice a day (giving me plenty of time to figure out how Wordpress works). Over the years, I’ve posted about writing and books and life, and I’ve met dozens of wonderful people who’ve showered me with support and friendship. I appreciate you all so much, and to demonstrate my gratitude, I’ve assembled a prize package to send to one lucky reader! This giveaway is open internationally, and will close on Thursday, April 23rd, at midnight EST. The winner will be selected randomly. He or she will be notified Friday, April 24th. 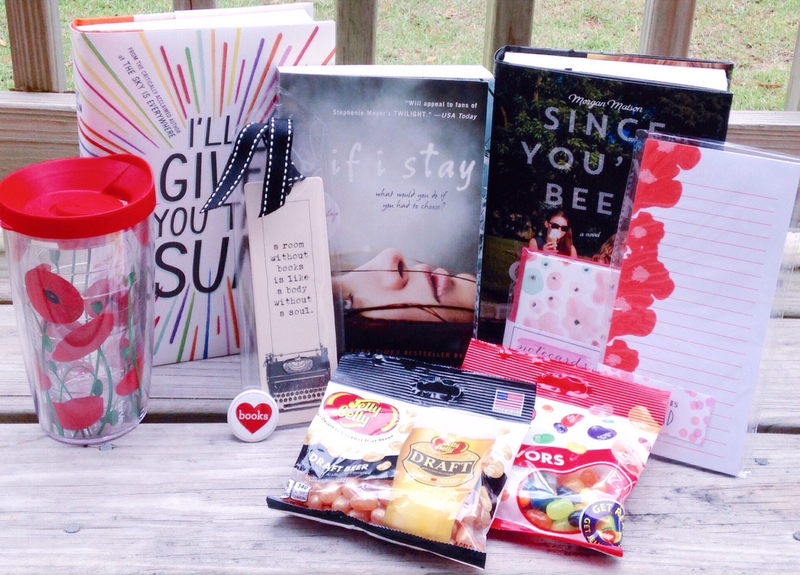 Novels by a few of my favorite authors (Jandy Nelson’s I’ll Give You the Sun, Gayle Forman’s If I Stay, Morgan Matson’s Since You’ve Been Gone), plus a Tervis travel mug, a bookmark and book-ish pin, a poppy notepad and package of thank-you cards, and Jelly Bellies — yum! 1. One easy automatic entry for all who comment on this post. Thank you for being generally awesome. Congrats! Lots of lovely stuff in your giveaway. I like that you always surround yourself with flower-patterns. Actually, my current bed-spread matches that mug! Spring colours, eh? Congrats, Katy! I love giveaways 🙂 But don’t throw me in the running–maybe some new Katy follower will win! Just wanted to say that I’m so glad for your blog because without I’d never have found you! Thanks for the chance, i am in ! Such a cute giveaway! Because we have such similar (fabulous) taste, of course I already own the books, so it’s probably silly for me to enter, but congrats on five awesome years! Of course I follow you on Twitter, and I tweeted your giveaway. Love this idea. I wonder when my blogiversary even is. Hey Katy! Congratulations on 5 years of blogging! That is amazing!! I have tweeted about your giveaway with a link and a mention. This would make a great early 30th birthday gift for myself! thanks for the chance and happy bloggiversary!! Happy, happy, happy blogoversary and wishing you many more amazing to come! 🙂 Thanks for the giveaway! Congrats on 5 years! I love your blog. Thanks for the opportunity. Oh, and I retweeted you on Twitter, friend. Have a great day! And happy blogiversary! Wow has it really been 5 years? Crazy!!! I remember the start! Congrats! Katy, you are so talented! I’ve enjoyed reading your blog and love your Instagram pics! 😄. Awww, such a cool prize package. Sure hope I win! 🙂 Love your blog! I don’t think I’ve been reading your blog for all five years, but I’ve definitely enjoyed it for the last two or three. Congrats on your anniversary. Congrats, Katy! I know I’ve kind of disappeared from blogging but I’m so glad our blogs connected us! You’re all kinds of inspiring and I love seeing what you have to say! Congrats on 5 years, Katy!! I love all of your book recommendations!!! Very nice! Happy birthday to your 5 year blog, wow. Congratulations on 5 years! That’s awesome! 🙂 I’m not always super interactive, but I love reading your blogs and seeing what you’re writing and what books you’re enjoying. And I already follow you on Twitter (@crystalschubert)! Congratulations on 5 years, Katy!! So excited for you and absolutely love your fantastic giveaway! You don’t need to enter me though – it would be so neat for a new follower to win 🙂 I just wanted to say THANK YOU for all of the many ways you have inspired and supported and cared for other writers. You have such a generous heart, and your blog always reflects that. It has been so exciting to share in your journey, and I am SO excited to see all that lies ahead for you and your beautiful stories ❤ ❤ Yay, Katy! Thanks, Katy, for some fabulous book recommendations! Congrats! And thank you for your book recommendations 🙂 Such a lovely blog you have! Not entering, but just wanted to wish you the happiest blogiversary!!! So glad to have found your blog (and you)!